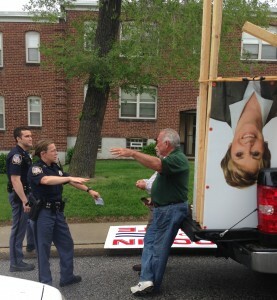 Baltimore County police talk to state Labor Commissioner Ron Juliis as he leans against a pick-up truck with signs for Connie DeJuliis. A Brochin for Senate sign lies on the ground. UPDATED 5/12, 12:45 p.m. with video. The state Senate Democratic primary in Baltimore County District 42 pitting Sen. Jim Brochin against former Del. Connie DeJuliis turned nasty over the weekend as Brochin campaign signs were removed by three men including Ron DeJuliis, the candidate’s husband and the Maryland commissioner of labor. 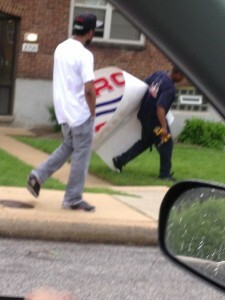 MarylandReporter.com has obtained photos of the incident from the Brochin campaign. UPDATED 5/12, 12:45 p.m. Here is a jumpy 6-minute video. Baltimore County police were called to the scene, a Parkville apartment complex at the busy intersection of Loch Raven Boulevard and East Joppa Road, and police issued a statement about the incident late Saturday. The Baltimore Sun has a full account of the events in which Brochin campaign manager Marc Lazerow says he confronted Ron DeJuliis. Connie DeJuliis told the Sun it was “a misunderstanding,” but her husband has been charged with a misdemeanor, according to a police spokesman. 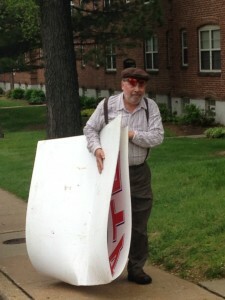 A man hauls a large Brochin sign away. At least two were loaded on the pick-up truck next to the DeJuliis signs. Ron DeJuliis has served seven years as an appointee of Gov. Martin O’Malley, who has helped Connie DeJuliis raise funds against Brochin, who has voted against the governor on key issues. Under MarylandReporter.com’s Creative Commons License, any media may use the photos with attribution and without charge. Another Brochin sign is removed by a third man.